Writing from Author JJ Bach: Book Covers - What Makes them Great? Book Covers - What Makes them Great? Every day I ask my eighth grader what she learned in school. Usually it's a snarky "nothing Dad". But I ask myself that question too. Book covers was the learning topic today. The awesome Joanna Penn led the way with a superb article on her blog The Creative Penn. She's a frequent blogger, so the article is: Book Marketing: On Changing Book Covers. For me, this is one of the top three reads on what should go into a book cover. I bookmarked it. JA Penn hit the nail on the head. Emotion. Theme vs. Character. Meeting Genre Expectations. And more. Go read it if you are struggling with book covers. Her article referred to an author I had never heard of, Russell Blake. He had another awesome article on making good book covers. Russell Blake Judging Books. He also posted the progression of the four book covers he had evolved through on the way to finding the one that he thought was best AND that also was supporting the strongest sales of the book. Great commentary on his thought process along the way. More great stuff if you are struggling with covers. So for the first time ever, here's the working copy of my first fiction book, River and Ranch Does Landscape reach out and grab with an emotional connect? Does a horse in a meadow in the mountains convey an image that leads to reading and buying? It lacks people. Is this a showstopper? Does this not convey what the book is about? 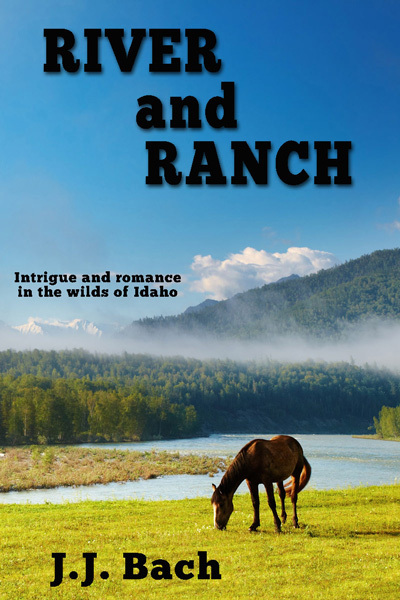 It is about a ranch and horses and riding in the meadows. But it is about people too. So for now it's a working cover until I can figure out something better.